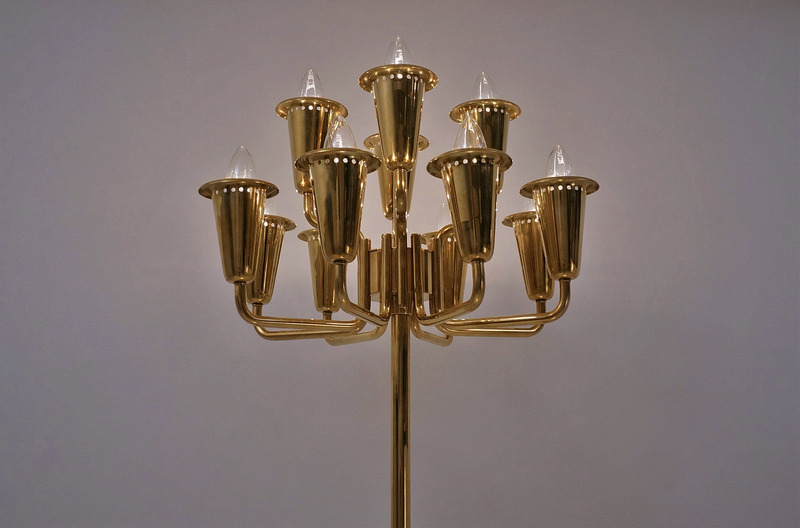 Stilnovo floor lamp in solid brass, 12 lights large candelabra, likely designed by Gaetano Sciolari, 1950`s ca, Italian. This vintage floor lamp has been gently cleaned while respecting the antique patina. 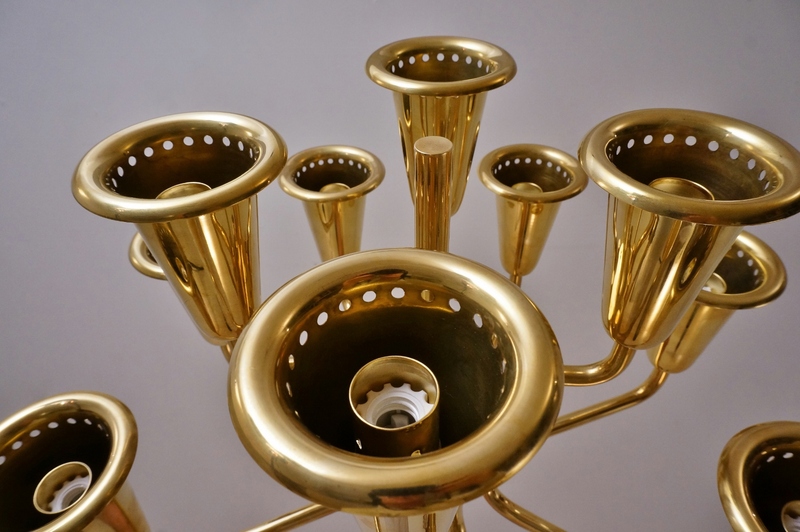 It is newly rewired, new brass lamp holders, earthed & ready to use. This lamp is compatible with other countries although it may be necessary to purchase different light bulbs suitable to local electricity. It is possible to use this lamp with a dimmer switch. Light bulbs included. 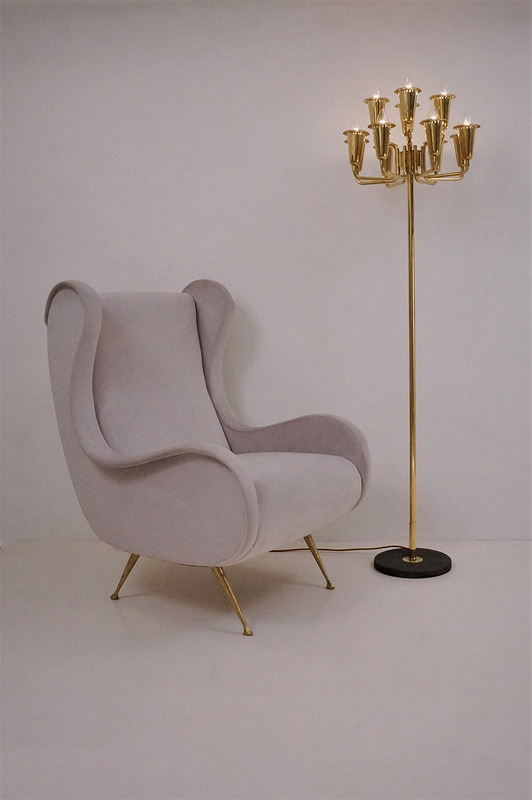 This large vintage floor lamp is attributed to Italian maker Stilnovo based on a number of design features. 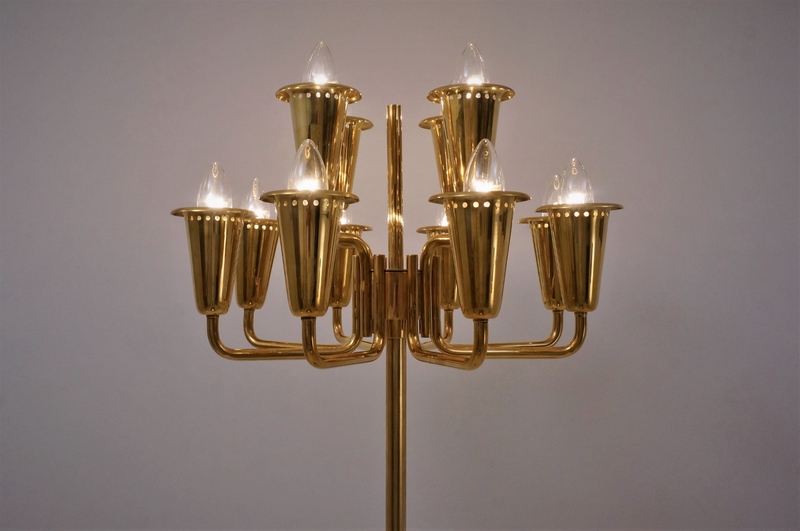 The solid brass structure, quality design, attention to detail and conical lamp holders, are all features of Stilnovo designs. Gaetano Sciolari is known to have designed for Stilnovo and many of these features are similar to his work. 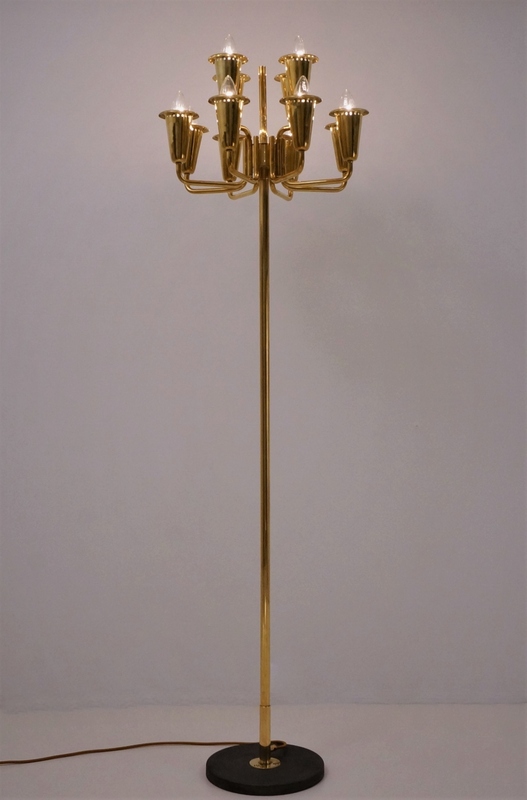 This particular design in a floor lamp is rare to find, unique, and interesting with the combination of elegant flowing design in solid brass and industrial elements such as exposed bolts and textured grey iron base. 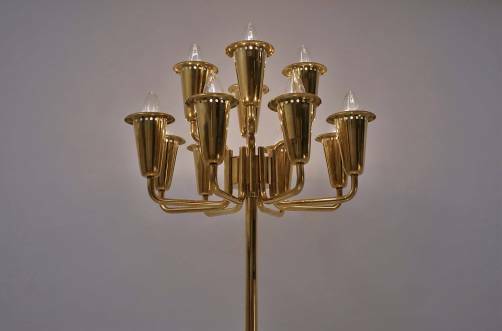 The unique combination of Modernism & traditional candelabra form, make this floor lamp a sculptural addition to a range of interiors such as Art Deco, Mid-Century Modern, Hollywood Regency, 70`s Glamour, Traditional or Contemporary. 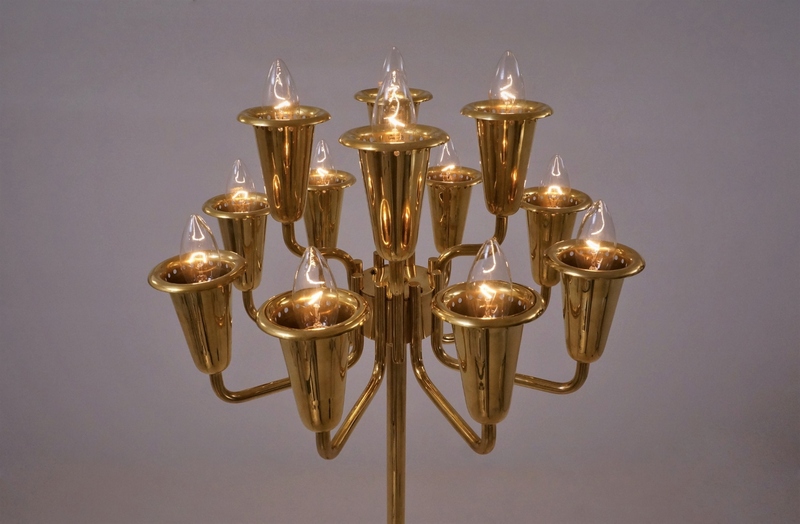 The eye is drawn to the large illuminated candelabra of 12 lights; 8 on the bottom row and 4 at the top. 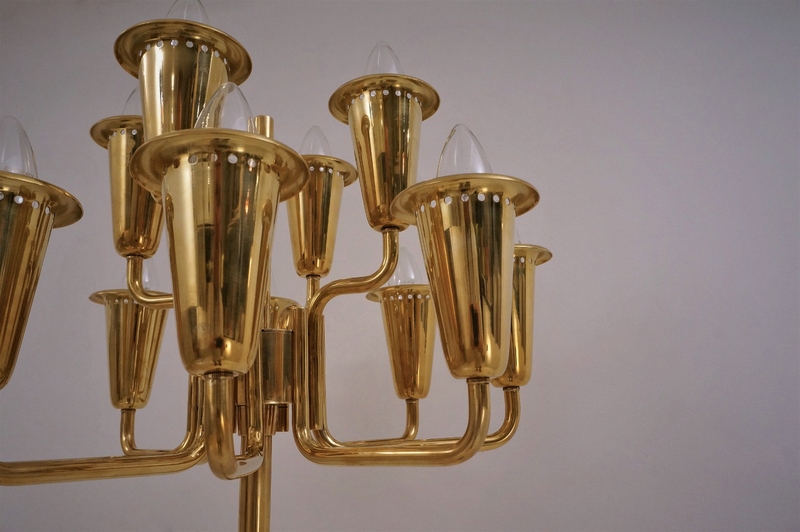 These tulip shaped lamp holders are trimmed with a simple row of circular piercings giving this piece the characteristic 1950`s Futurisitic look. 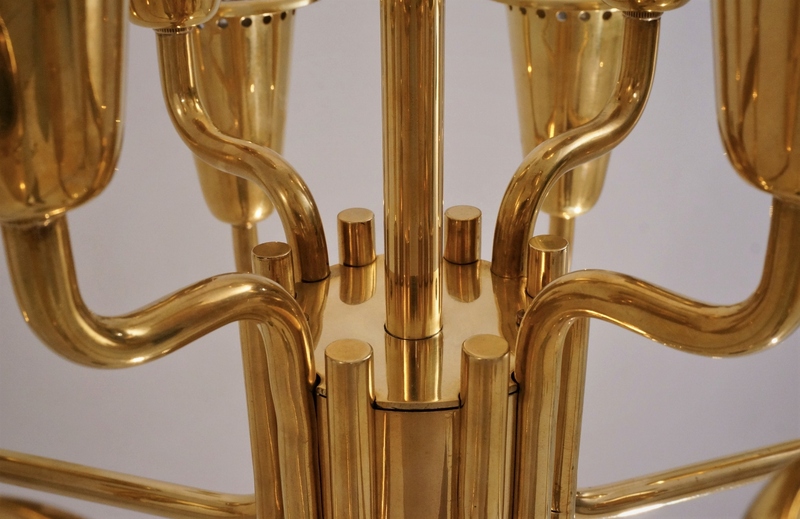 Brass tubular arms holding the lamps run in geometric right angles; the top row fitting in the niche created by the bottom arms. Each arm is sealed to the other end, and attach to a large central solid brass disc which is a continuation of the central column. 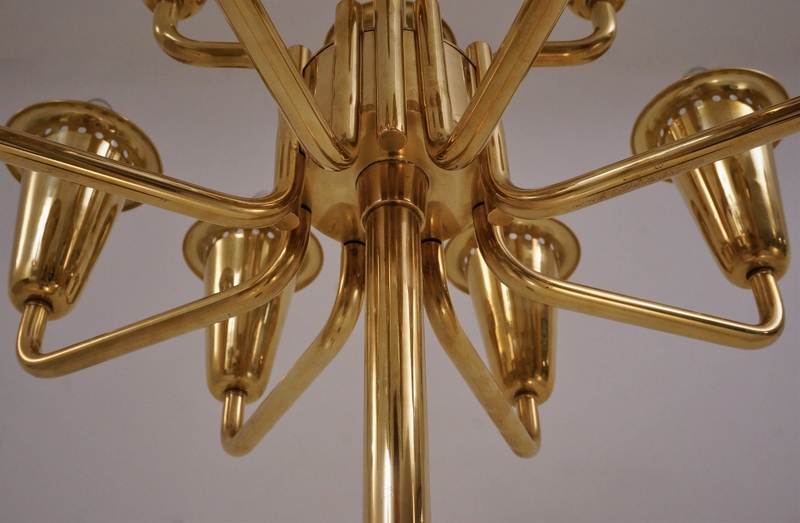 The top is finished with a brass plate & finial of the same tubing as the arms. There are 2 decorative screws holding this plate in place and allowing access to the wiring & bolted arms. 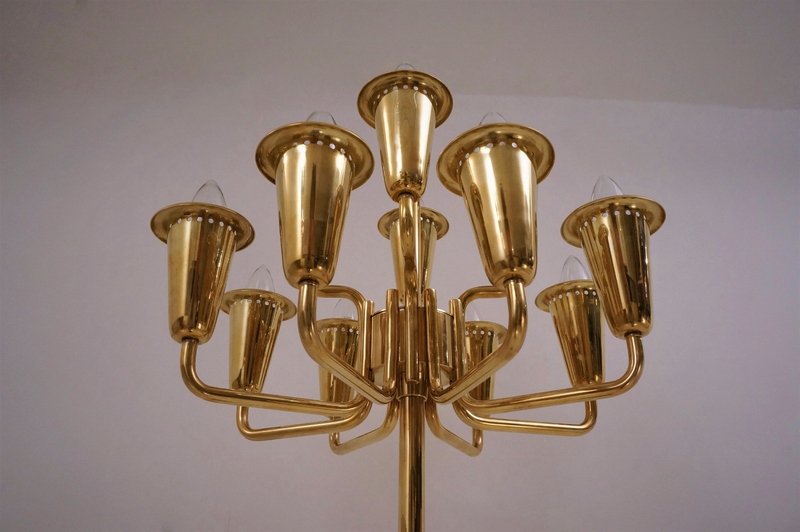 The central column is also of solid brass and contains the main wiring. The candlelabra top portion of the frame screws into this central column. 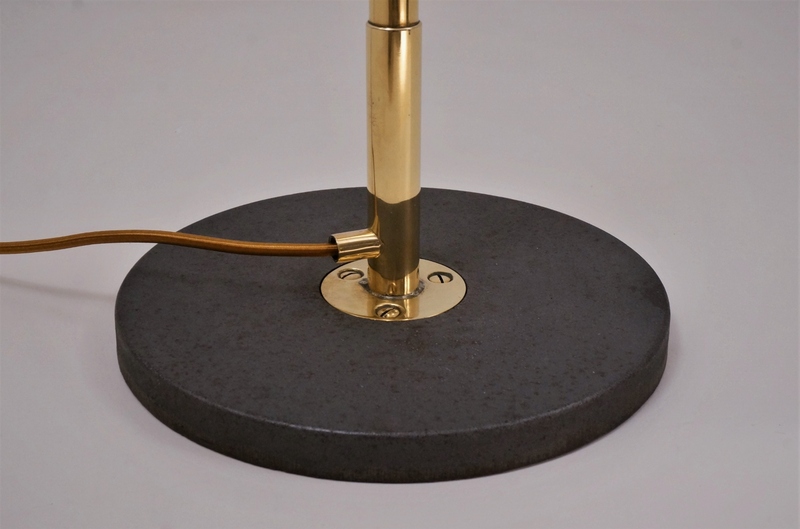 The circular base has a chic combination of grey textured iron and warm toned brass. In the centre there is a circular brass plate with 3 large decorative bolts holding securely to the weighed iron base. The weighted base make this lamp strong & stable. Rising from this plate is an insert for the central column to screw; from the side the main cable runs out. This floor lamp takes 12 standard small screw E14 light bulbs up to 60 Watts each. At present fitted & photographed with clear Candle shape light bulbs of 25 Watts, which are included in the price. Other E14 light bulb shapes could be used for a slightly different look. This lamp has been fully newly rewired & PAT tested with earthed gold-tone silk cable, new brass lamp holders & new black plug. It can be used with a dimmer switch on the wall plate. 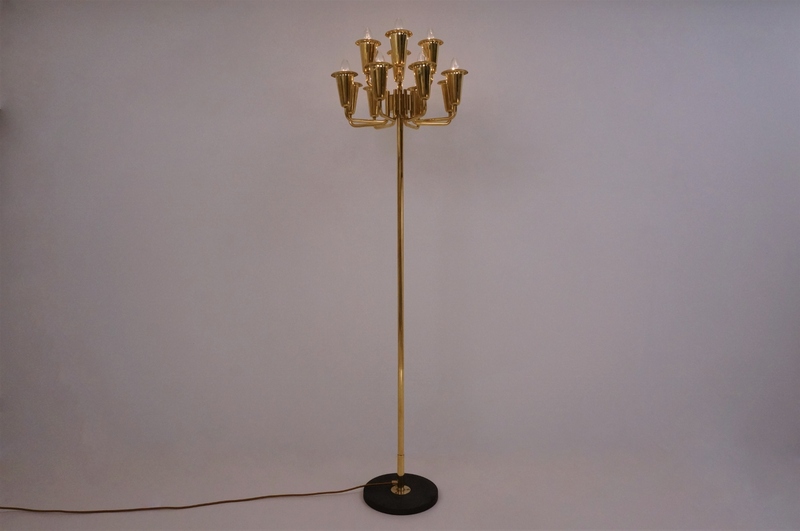 This floor lamp is all in very good condition. The frame is sound & stable. The solid brass surfaces have a warm aged patina developed over time adding character to the piece. Packing is offered free of charge. We take special professional care while packing. This lamp would be wrapped securely in bubble wrap & an outer layer of card. It could easily fit in a box for safe transport with a courier or Fedex. 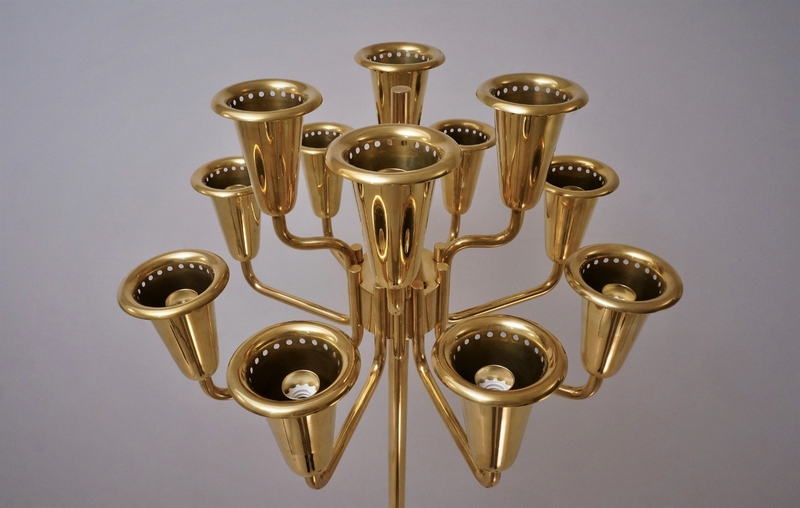 Stilnovo lighting was founded in 1946 by Bruno Gatta in Milan, Italy. 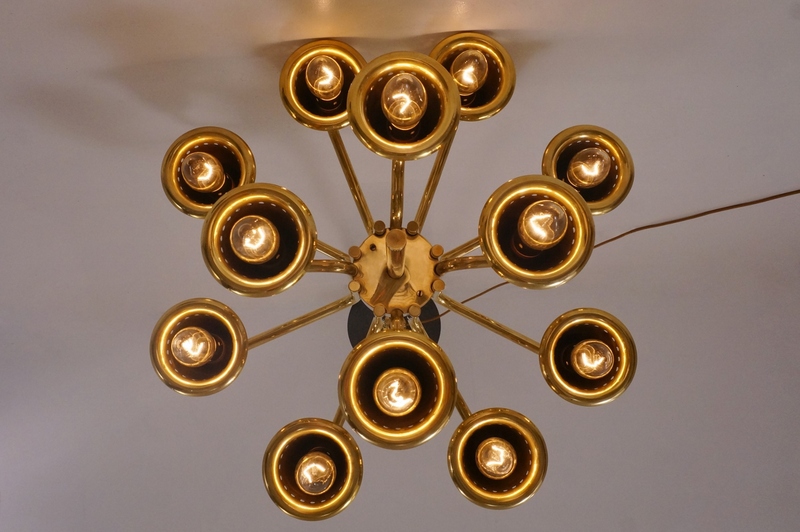 Read more on our Roomscape Blog about Stilnovo Lighting.